Life Before the Dinosaurs: Opabinia. 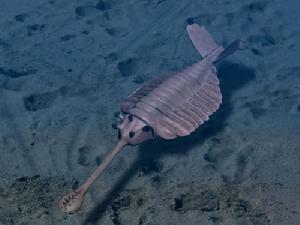 Opabinia was a strange Cambrian arthropod with five eyes, a v-shaped tail, and a long stalk, with jaws and a mouth under its head. It used its long appendage to grab prey. Then it would shove the prey into its circular mouth. The name is pronounced oh-puh-BIN-ee-uh. 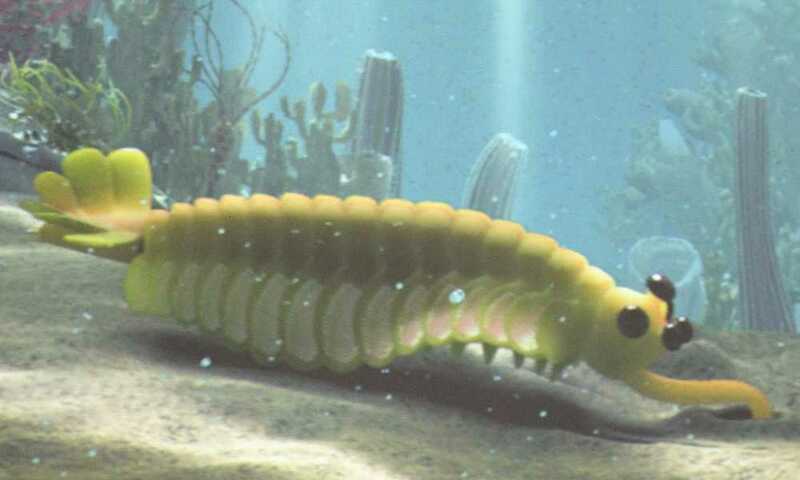 Opabinia probably hunted in worm burrows by sticking its long appendage into the burrow, and then pulling out the worm inside. If there was a worm in that burrow. Opabinia was about 3" long. 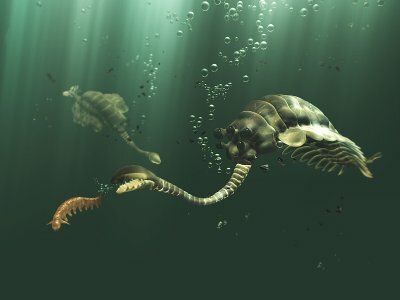 Opabinia had predators, like Anomalocaris and Sanctacaris. It hunted on the sea floor. Why 5 eyes, Art? Does that seem unusual to you not to have an even amount? And isn't it interesting that a creature with 5 eyes did more hunting with its front appendage than anything else?? A wild initial hypothesis here might be, somehow, an ancestor's bilateral symmetry was genetically short-circuited (yielding one eye and one appendage where there might have been two) and somehow proved evolutionarily advantageous, if only bcause they required less energy without proving to be a disadvantage (the thing already has four other eyes,and that one appendage may have been stronger, with greater leverage or whatever). But, again, that's me guessing wildly, as it seems more efficient simply to have started with five eyes (which'which is what I'm going to call the hamburger place from now on) and one appendage. It's just, so far as I know, unusual, is all (was there anything else like this?). Five Eyes Burgers and Fries is very funny!!!!!!!!!! It probably needed that many eyes to sense all those monster predators, like Sanctacaris, that 4" long creature with ten feeding appendages, and Anomalocaris, that 6' thing with those two spiky claws and the circular mouth. Cicadas today have five eyes. Apparently lots of insects have five eyes, such as flys, bees, wasps, praying mantis. Between the two large compound eyes are three small simple eyes (arranged in a triangle).